ARKit made its debut with iOS 11 in September 2017 and immediately caught our attention but its limitations were obvious. With iOS 11.3, the ARKit got more powerful with the ability to track vertical and non flat surfaces. Realistic rendering – The rendering of AR object is already good. Apple did not say much about it but we expect more this year. 3D object detection – ARKit detects flat rectangle objects like posters or book covers, but ARKit 2 lets developers detect 3D objects fully. It is going to be huge. Persistent experiences – You will be able to save AR spaces linked to physical objects to be picked up later. You can start from where you left off. Shared experiences – Multiple users can view the same virtual environment on their iOS devices with their own view. Apple presented a virtual playspace where up to four players can interact with a combined virtual and real play space all at once. Improved face tracking – Apple didn’t say much about this, but the name is self-explanatory. 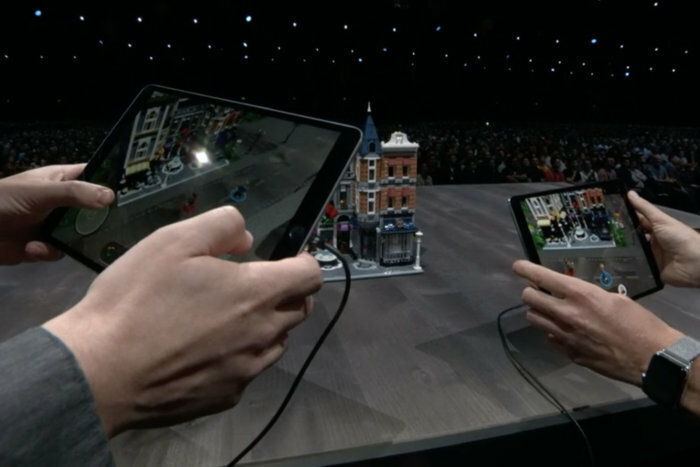 LEGO showed an impressive demo that used nearly all of ARKit 2’s new capabilities: 3D object detection, multiplayer, and persistence. Apple will launch its own app called Measure. The word is self explanatory. The app will take virtual measurements of lengths, volumes, room sizes and much more. Measure lets you make linear measurements of real-world objects, along all three axes. It looks like many AR measurement apps out there. It will help you compute volume even of 3D objects, you can even make linear measurements. You can just point at a poster, a photo or a table and get full measurement for the object. Measure automatically recognizes rectangles, so you can measure with a single tap. This is one of Apple’s simpler apps, like the Calculator, Compass, or the built-in Flashlight. And like those apps, it’s an appropriate thing to have built into your phone, but not the sort of groundbreaking experience that will make people switch to iPhone. Apple worked with Pixas to create a new file format for AR objects called USDZ. It will be supported by third party apps like Autodesk, Adobe, Sketchfab and many more. Adobe CTO Abhay Parasnis took to the stage to say that Creative Cloud will also support the USDZ format.